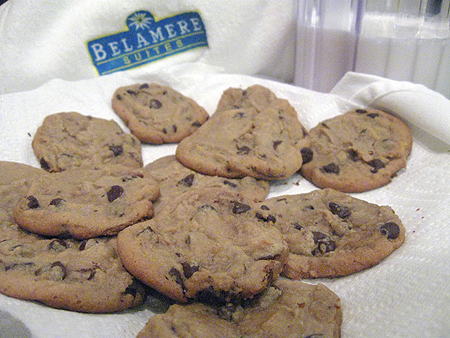 You may not have heard of Belamere Suites. And if and when you go there, you won’t see any cars. This amazing place for a couples-only getaway, known as a “boutique hotel”, is just south of Toledo. People I know probably don’t even know they drive by it regularly. Toledoans, next time you’re at Levis Commons, look over at the Waffle House, then a little further. You’ll then finally see the sign above the trees that are just west of the mosque across I-75. Belamere is in those trees right there at the I-75/I-475 split. You have to take that road by the gas station next to the Waffle House, and drive back behind the trucking company. It’s that out-of-the-way. Drive up to it. The only cars you’ll see are employee cars. That’s because each room has its own garage. Rooms also have no windows. But what each room does have is either a two-person jacuzzi or … get this … an 11′ x 18′ pool. In the room. And then there are the spacious two-shower-head showers with glass-block entrances and elegant black tile with gold specks throughout. Yeah, it’s that kind of place. And most of all, it’s clean, bright, and far from cheesy. Call the front desk from the room. They’ll bring fresh coffee. That’s a whole pot of coffee, brewed when you ask for it, or a bottle of wine, already chilled in a bucket of ice. They’ll bring fresh-baked rolls and muffins for breakfast with more fresh coffee. And if you want warm cookies and milk in the evening as seen in the above pic, they’ll bring that as well. Sure, we’ve been there. The first two nights of our honeymoon in 2005, we were there, before driving up to Torch Lake near Charlevoix, Michigan, for a few more isolated days. And we’ve been to the Belamere since as well. Are you part of a couple? You should go. Seriously. And if Mary and I are there at the same time you are … none of us will ever know it.